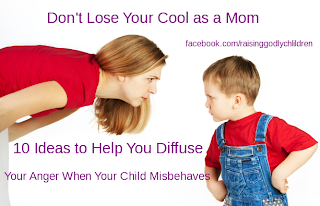 Don’t Lose Your Cool As a Mom- 10 ideas to help you diffuse your anger when a child misbehaves. We’ve all been there. You ask your child (for the fifth time) not to do something, only to turn around and find him doing that very thing. A situation like this one can get even the calmest person’s blood boiling and might normally lend itself to yelling, screaming, or harsh anger. Although the misbehavior needs to be dealt with swiftly and fairly, there are much healthier alternatives to losing your cool in the process. Implement one of the suggestions below to keep yourself in check. Once the misbehavior is handled in a calm manner, try one of the “After the situation” suggestions to get your blood pressure back to normal and restore unity in the home. And before you think I’m claiming to be an expert on the topic, let me assure you that you couldn’t be further from the truth. In fact, I’m writing this as much for my benefit as anyone else’s! 1. Pray. Pray for patience. Pray for peace. Pray for the supernatural ability to handle the situation as God would want you to. 2. Take a few deep breaths. As you exhale, attempt to mentally release whatever anger you are harboring. As cheesy as it sounds, it helps. 4. Be spontaneous—don’t say a word to the kids, but instead go outside and start blowing bubbles (or something equally as fun). Invite them to join you whenever they are ready. Obviously, this should happen after the discipline and consequences have taken place. 5. Open your Bible and quickly thumb through your index to find some Scriptures on anger. Repeat them over and over to yourself. I’ve also found it helpful to have those particular Scriptures memorized so that they can be recalled at a moment’s notice (Proverbs 15:1, anyone?). 6. Turn on a movie for the kids and jump in the bathtub. Although I don’t think TV should frequently be used as a babysitter, you shouldn’t feel guilty in those moments when you need to use it as one (for your own sanity and for the temporary well-being of your children). 7. Start a tickle fight. After moments of tension (especially after a child is disciplined), she needs to be assured of your love for her and that you generally enjoy spending time with her. What better way to show that than a tickle fight? Plus, laughter is good for the soul … so everyone wins! 8. Read a book together. There are few things in our household that will calm my very energetic boys quicker than sitting down to read a book in my lap. Not only does this give everyone an opportunity to settle down, it also allows for some good cuddling time. 9. Spend some one-on-one time with the perpetrator. If you have more than one child, it is amazing how enjoyable and easy it is to spend time with just one child at a time! And it could be that the child who ignited the flame of fury could be needing just a little bit of affirmation. Taking an hour or two to spend time with that child will not only reassure him of your love, but it also will be an enjoyable bonding experience for both of you. 10. Stop feeling guilty and inadequate. 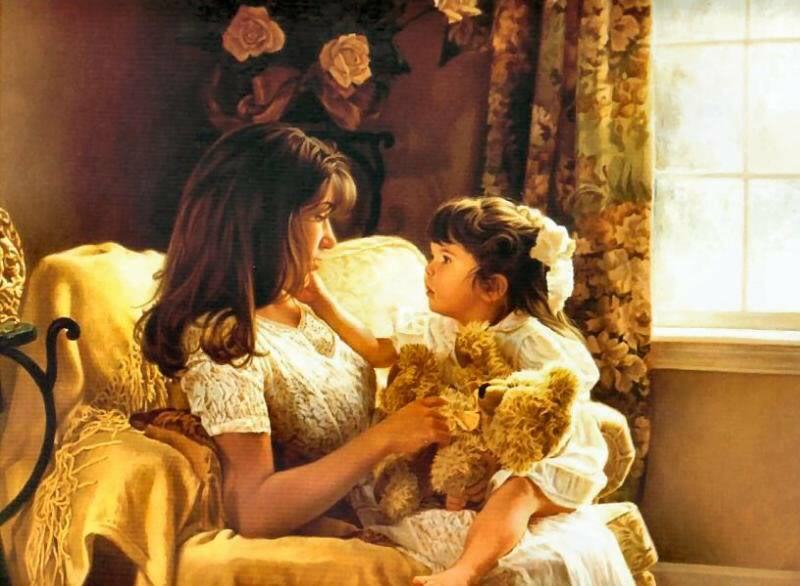 Every mother has regrets—for an unkind word, perhaps, or a harsh tone, or full-blown screaming. I fervently believe that God uses child rearing to humble our (at times) prideful hearts. Through this He is teaching us to rely on Him and not to depend on ourselves. We can’t be the kind of mothers we want to be, or the mothers our children need us to be, on our own. We must look to His strength, love, and kindness. Those feelings of self-doubt and continual guilt are not from God. They are Satan’s way of attacking us. When we feel like this, we become debilitated. We become grouchy. We become irritable and short-fused. We don’t want to serve because we don’t feel like it. And that’s just what the enemy wants. So next time you are faced with an otherwise explosive situation as a mom, try one of these tips to help diffuse both you and everyone around you. This article originally appeared on MomLife Today®, FamilyLife’s blog for moms. Copyright ©2013 by Jenae Jacobson. All rights reserved. Used by permission.